I am currently researching the chemistry of the indoor environment through a combination of field work and laboratory studies. I am particularly interested in the indoor fate of semivolatile organic compounds and the relative contributions of deposition, ventilation, and chemistry to SVOC removal. Other projects focus on aerosol chemistry, reactions of multifunctional hydroperoxides, and gas-wall partitioning in Teflon environmental chambers and Teflon sampling lines. Pagonis, D., Krechmer, J. E., de Gouw, J., Jimenez, J. L., and Ziemann, P. J. (2017). Effects of gas-wall partitioning in Teflon tubing and instrumentation on time-resolved measurements of gas-phase organic compounds. Atmospheric Measurement Techniques, 10:4687-4696. Petters, S. S., Pagonis, D., Claflin, M. S., Levin, E. J. T., Petters, M. D., Ziemann, P. J., and Kreidenweis, S. M. (2017). Hygroscopicity of organic compounds as a function of carbon chain length and carboxyl, hydroperoxy, and carbonyl functional groups. Journal of Physical Chemistry A, 121:5164-5174. Krechmer, J. E., Pagonis, D., Ziemann, P. J., Jimenez, J. L. (2016). Quantification of gas-wall partitioning in Teflon environmental chambers using rapid bursts of low-volatility oxidized species generated in situ. Environmental Science & Technology, 50:5757–5765. 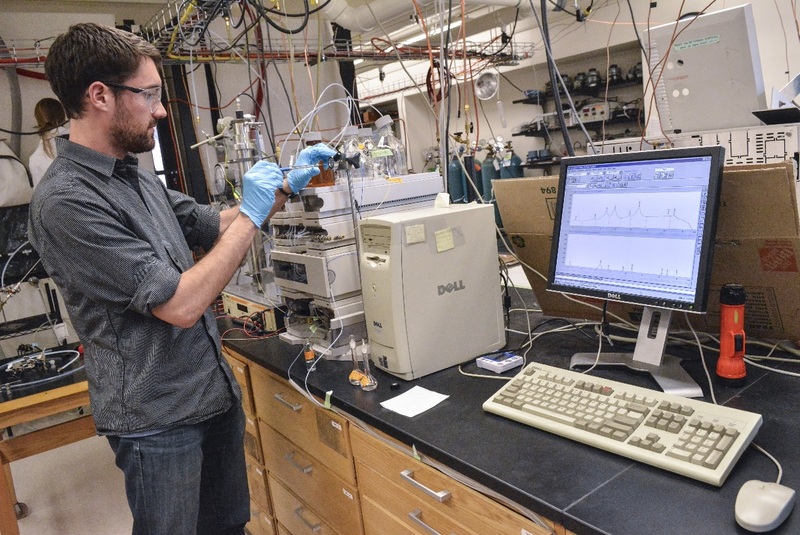 We utilize a wide range of analytical chemistry techniques to study the chemistry of organic aerosols, including LC, GC, mass spectrometry, FTIR, NMR, and more. In 2017 we conducted a six-week field campaign at the CU Art Museum, measuring indoor air quality inside one of the art galleries.